WooCommerce is one of the most popular plugin for WordPress. Main benefits of this platform are user-friendly interface, advanced SEO and marketing tools, excellent security. However, every coin has two sides and WooCommerce has disadvantages. e-Commerce solution has a lack of currencies, languages, shipping methods. 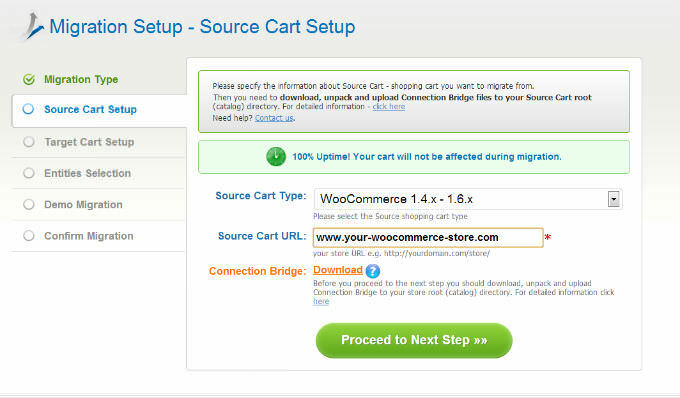 That’s why a lot of entrepreneurs decide to migrate from WooCommerce to Shopify, which is a hosted solution. Shopify was launched in 2005 and today powers more than 30000 online stores. It has a high level of security and support and more than 50 payment gateways. Moreover, themes can be customized via user friendly editor and CSS/HTML files. 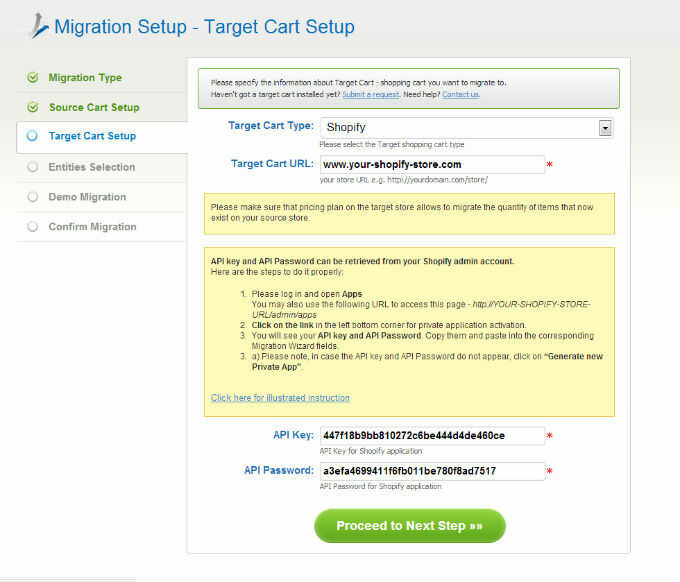 In a case, you’ve decided to perform WooCommerce to Shopify migration, Cart2Cart will help you. The process of data transferring is fully automated, so you don’t need to have high programming skills. Time of migration depends on quantity of entities you wish to move. All you have to do is to follow an easy step by step instruction. Create Cart2Cart account or sign in with your Google or Facebook account. Here, you have to pick WooCommerce from the list and enter store’s URL. After that, you have to install a Connection Bridge. To perform that, download a file to your computer and unpack it from zip archive. Then paste it to store root directory. For more detailed information, look through FAQ with video tutorials on how to install Connection Bridge. Go to APPs menu and there in the left bottom corner click on the link for private application activation. There you will see API Key and API Password. You have to copy and paste them to the corresponding fields in wizard. Read our FAQ to find more information. At this point, you will be able to choose entities, which you wish to move to Shopify store. You will be able to select additional options. Cart2Cart provides a possibility to map currencies on your Source and Target Stores. 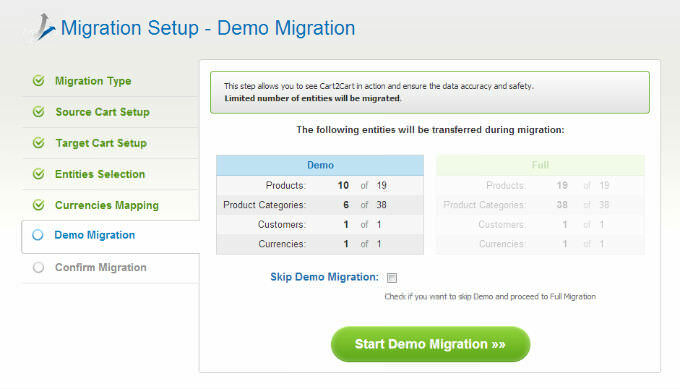 What is Demo Migration? It is the process, which will help you to understand how the service works. Up to 10 entities will be transferred to Shopify for free. It is not necessary to perform it, but highly advisable. Note that you don’t have to close a browser window when Demo Migration is in progress. 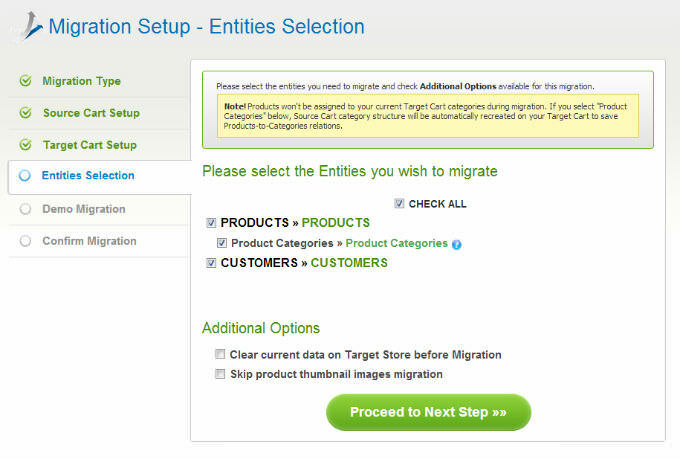 In a case, you are satisfied with Demo Migration results, the next stage is Full Migration. Before you start, check entities one more time and make sure you have enough funds. Now press Start Full Migration button. 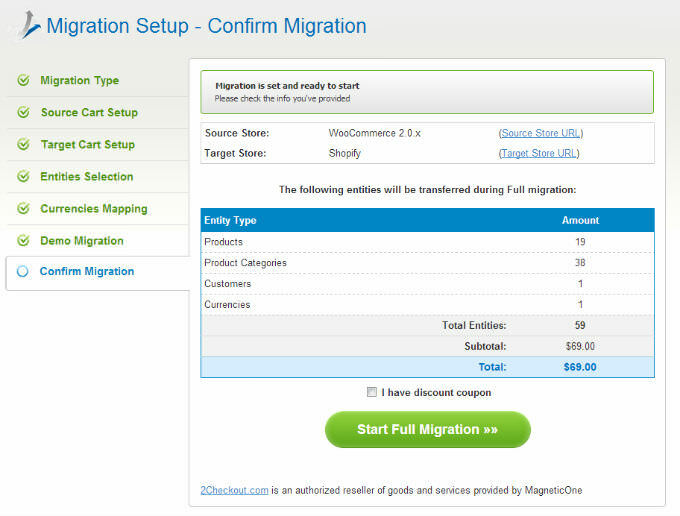 The process of migration will take some time, so at this point you will be able to close a browser window. You will receive an email notification when migration is completed. After that, you can check results of data transferring on Shopify store. That’s it! We can congratulate you with just established Shopify store. In a case, you face some problems or have questions, feel free to contact Cart2Cart Support Team.